Recent release “Good Morning! 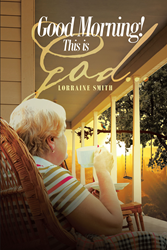 This is God” from Page Publishing author Lorraine Smith is a resonant compilation of spiritual thoughts and scriptures that guide readers in unveiling the messages of God in their lives. Lorraine Smith, a pastor for over twenty years, a hospital administrative assistant to the CEO, a director of medical staff services/credentialing, an executive secretary to the chief of police, and an assistant city secretary, has completed her new book “Good Morning! This is God”: a gripping and potent read that bears enlightening thoughts and insights that lead toward a stronger, deeper relationship with God. Published by New York City-based Page Publishing, Lorraine Smith’s inspirational book infuses encouraging mindsets and prayers directly inspired by the author’s personal insights and invites readers to write their own realizations and join her in a journey to holiness and fulfillment. Readers who wish to experience this uplifting work can purchase “Good Morning! This is God” at bookstores everywhere, or online at the Apple iTunes store, Amazon, Google Play, or Barnes and Noble.